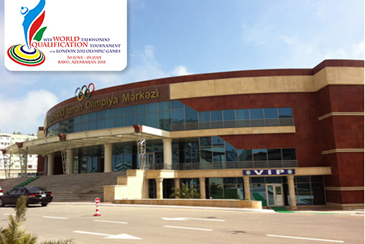 The WTF World Taekwondo Qualification Tournament for the 2012 London Olympic Games will kick off on June 30, 2011 for a four-day run in Baku, Azerbaijan. A total of 109 countries submitted their entry forms for 345 athletes, 194 men and 151 women, to the WTF as of the final June 10 deadline. Each country may enter a maximum of two male and two female athletes, with one athlete per weight category. The four-day tournament, which will take place at the Sarhadchi Olympic Center in Baku, will feature four male and four female Olympic weight categories: -58kg, -68kg, -80kg and +80kg in the men’s division, and -49kg, -57kg, -67kg and +67kg in the women’s division. The top three athletes in each weight category will qualify their respective National Olympic Committees (NOCs) a spot for the London Olympic Games. A total of 24 athletes will qualify their NOCs a place each for the 2012 Olympic Games through the World Qualification Tournament. For fairer judging, the tournament will use a protector and scoring system (PSS) and an instant video replay system. Three courts will be used at the Baku tournament. A single elimination system will be applied throughout the tournament without repechage. The two finalists in each weight division will qualify their NOCs a place each for the Olympic Games regardless of the results of the final match, while an additional match between the athletes eliminated in the semifinals will be held to determine the third-placed winner. The athlete lost to the first placer at a quarterfinal will be classified as the fifth placer, while the loser to the second, third and fourth placers will be classified as the sixth placer. The WTF shall confirm to the NOCs with copy to national associations the quota places they have achieved within two weeks after completion of the World Qualification Tournament. Each NOC then has up to two weeks to confirm to the WTF the use of these quota places. If an NOC qualified thorough the World Qualification Tournament relinquishes a quota place or has not confirmed the use of the qualified place(s) within two weeks from the moment receiving the allocation letter from the WTF, it will be allocated to the NOC of the next highest placed athlete in the pertinent weight category as long as the quota places for the NOC do not exceed the maximum quota of two male and two female athletes. Great Britain, the host country of the London Olympic Games, shall not participate in any of the qualification tournaments, as it shall be automatically qualified in two male events and two female events. Great Britain has informed the WTF that it will send its athletes at the London Olympic Games for the -68kg and -80kg in the men’s division, and -57kg and -67kg in the women’s category. A total of 60 international referees, including 10 review juries, will officiate at the tournament. The 60 were selected from among participants in the three WTF-organized international referee selection and training camps for the taekwondo competition of the 2012 London Olympic Games. Compulsory anti-doping tests will be carried out for all the 24 qualifiers and 16 reserve athletes. At the World Qualification Tournament, medals will be awarded to the top three athletes in the respective weight divisions. The head of team meeting and the drawing of lots session will take place on June 28 at the competition venue of the Sarhadchi Olympic Center, while the opening ceremony of the tournament will take place at the same venue on June 30. Twenty five percent of the registered athletes per weight category will be seeded based on the WTF World Ranking as of June 1, 2011. In the event that the registered athlete from the host country of the World Qualification Tournament, Azerbaijan, has not been included in the 25 percent, he or she will be seeded at the last place of the seeded 25 percent. A total of 128 athletes will compete for top honors at the taekwondo competition of the 2012 London Olympic Games. Of the 128, 24 spots will be decided each through the Baku World Qualification Tournament, the Asian Qualification Tournament (on Nov. 4-6 in Bangkok, Thailand), the Pan American Qualification Tournament (on Nov. 18-20 in Queretaro, Mexico) and the European Qualification Tournament (on Jan. 27-29, 2012 in Kazan, Russia). Sixteen sports will be decided through the African Qualification Tournament to be held on Jan. 11-12 in Port Said, Egypt, while the Oceania Qualification Tournament will decide on eight spots for the taekwondo competition of the 2012 London Olympic Games. Four spots will be decided on through the tripartite consultation among the IOC, the ANOC and the WTF, which are known as “wild cards,” while the host country of Great Britain will secure four spots automatically.